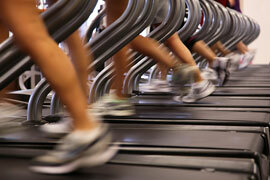 Individuals and stores that want to sell new or used treadmills can often find an interested audience on eBay. Because treadmills are large and heavy, it makes sense to used calculated shipping. Once you choose the package size, weight, and shipping method, the buyer can enter his or her zip code for the exact shipping cost to his or her location. Buyers of treadmills may also want to indicate that the auction is "pick-up only" for those in the buyer's local area. This prevents the buyer from having to go through the hassle of packing and shipping an oversized item, and puts the burden of delivery on the buyer.